Me, Myself and I: Another Blog? Surely, I will get my own domain this time for my other blog and I haven't decided yet if I will be getting a web host service from the latest list of cheap web hosting providers. Up to now I haven't made a research on the difference of getting the service of blogger from the web host sites on the list. 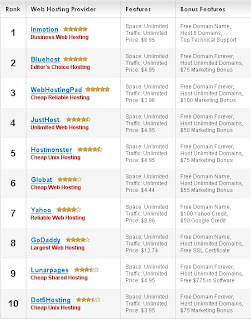 All of them offers free domain, host unlimited domains and unlimited traffic and space. It all boils down to the price and the customer service they can provide to their subscribers. I'm thinking of availing one web host for this blog. The other blog that I'm planning to create will have to take a backseat. Maybe I should create a poll and asked my fellow bloggers on what they think is the best web host for them. So far, JustHost is the best blog hosting in the net but it seems that they lean more in Wordpress as the blogging software. Will that be a problem if I'm using Blogger? Uy, lagi tayong pareho Kerslyn ah...hehehe.